Your job is to handle all registration needs during two check-in times. The first is Friday from 6pm to 8pm helping the youth staff hand out name tags, collect payments if payments are due, hand out shirts, get singed medical forms if medicine is needed, and direct students to their sleeping rooms to unpack. The second is on Saturday from 8am to 10am. Your job is to help take care of the business side of the retreat (very important). The check-in progress which might be a little tricky with the rain, but we will have two stations. One is near Cannon Hall under covering where parents will get out of cars and check-in their students. Your job will be to main this first station. Then parents will be back into cars to drive up to sleeping areas and drop off bags and stuff at second station. We will have staff at the second station to help unload bags. Please bring rain gear and large umbrellas, you will need them for Friday and throughout the weekend. What time do I need to be there on Friday? Check-in crew are asked to be at Camp Hargis by 6pm on Friday. If you have a youth attending, they are welcome to come early also. We will have chicken for all adults to eat on Friday because we are asking you to be there early. What buildings will we be using? 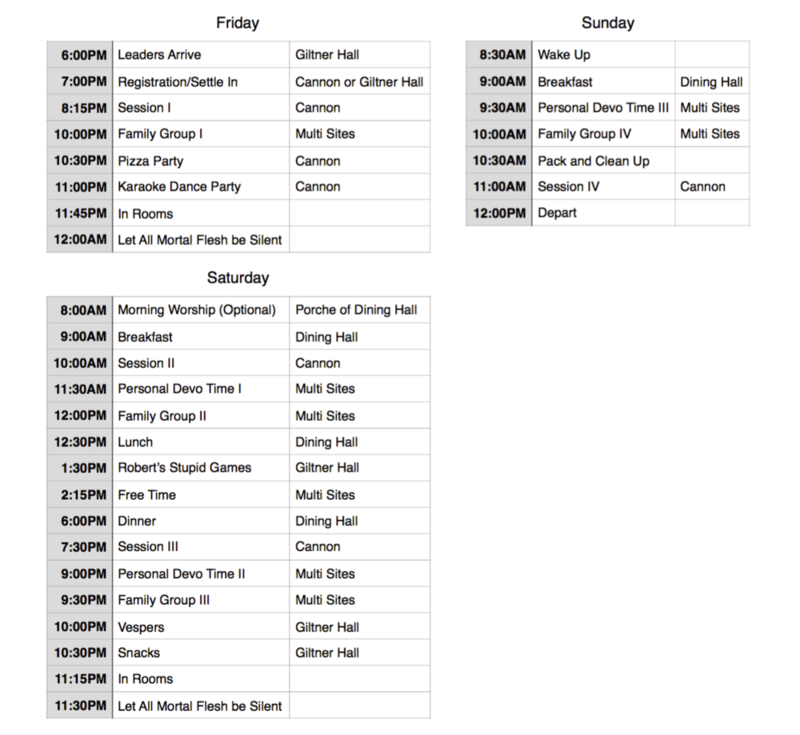 We have three main buildings that we will be using this weekend: Giltner Hall, Cannon Hall, and Dinning Hall. Worship sessions will be the Cannon Hall, all together meetings like vespers will be in Giltner Hall (along with sleeping rooms), and all meals will be at the dinning hall. The have two other buildings we will be using for sleeping arrangements. Important: The snack area will be in the small kitchen area of Giltner Hall. Do I have to wear the bright yellow shirt with a rat on it? Yes, yes you do. All day Friday! If you have any other questions, please let Monica know.